Persnickety Pretty In Pink collection launched yesterday. Were you one of the customers who placed their preorders on the first day? Or are you still trying to make up your mind about the outfits you love the most? Either way, read on! Based on our sales yesterday, we will tell you which outfits our customers love the most. We will also give you an idea about which pieces are more likely to sell out soon and which might stick around for a while. Here we go! The hottest Outfit from this collection has been Olivia Jumper paired with Hazel Pant and Emiline shrug. Olivia jumper is a classic Persnickety style that our customers have always loved. Three rows of colorful ruffles in the back add playfulness to this sweet top. This piece is made for layering. Wear it over one of Persnickety tees when it is cool outside or just by itself in the springtime when it starts to warm up. In this particular outfit Persnickety Olivia jumper is shown over a cream mesh tee. The other two outfits that have sold really well are Persnickety Pretty In Pink Hi Lo Sweater in Pink paired with Persnickety Denim Skinnie jeans in purple. You can also pair it with any other jeans from your girl's closet. Cicily dress in pink was also very well received by our customers. A few other pieces you might want to grab early are Persnickety Pretty In Pink Ruffle Sleeve Tee and Trippe Ruffle Leggings in Pink. Before we proceed any further we would like to remind you that fashion is the matter of personal taste. There is no right or wrong here. You know best what looks good on your child and what she likes and doesn't like. This blog post is based on our sales data and we are only suggesting that some outfits might stick around longer than others. So, here are the outfits you can probably wait on. Persnickety Avery Top and Lace Gaucho pants. We personally think that this is a stunning look that can be worn over and over again. The Avery top looks great over a pair of skinnie jeans while the lace gaucho pant will dress up any Persnickety Clothing look. The other two sweet outfits you can wait on are Persnickety Pretty In Pink Ellen dress and Ruffle Sleeve Tee with Pink applique paired with Bell Pants in pink. 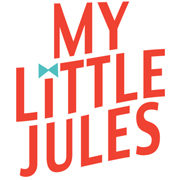 Don't forget that at My Little Jules boutique all orders of $79+ are shipped for free in the US and Canada. First-time customers get $5 off with code welcome. All customers get 5% back with our Jules Rewards program.